the rain dropped over his head. The sky may be bright blue in the morning but suddenly it turns cloudy in the afternoon then heavy rain falls. The first rainfall of May is said to be the start of the the rainy season but the weather is expected to be more sun than clouds for the next few weeks. There were two separate heavy rainfalls during the week. 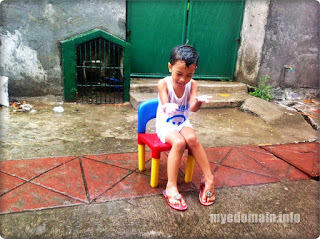 I just allowed Kiko to play under the rain yesterday with his Papa. I was reluctant to let him join the kids in the neighborhood during the first rain shower because I believed it's dirty rain yet so, he just watched them from our window. Dirty rain may mean acid rain or the product of the reaction of rain with nitrous oxide (NOx). Researches show that emission coming form motor vehicles are the biggest contributor to NOx in the atmosphere that's why the first 3 or more rain falls after a long time can be harmful. My childhood memories about playing in the rain is almost associated with cloud seeding. There was an extreme dry season back in the late 1980's and I remember the oldies talking about cloud seeding whenever there's rain during that time. It's a different story now. We have a lot of rain but there's the risk of dirty rain as what you've mentioned in your post. With the warm days, it would be fun to run and have fun in the rain. Fun in the rain. Playing under the rain is part of our childhood. I've been there too, experiencing your first rain shower. Ang sarap ng feelings. Sana bata uli ako. nice! our last month also back in singapore was pouring rain!! One of my friend told me to let my daughter and the other kids in the condo play in the rain that day as they will enjoy it and will remember when they part ways and so she is very right. Funny thing I was about to enjoy the rain a while ago but my happiness stopped in just a snap after 10 minutes of rain fall tssss. I really missed playing in the rain when I was in the province. I agree! weather here in our country is so unpredictable. I remember the days where I used to play under the rain.. it's really a nice experience! I remember when I was a kid...we never let passed the first rain of May. Aw. I wish my daughter could enjoy the rain as well! She is too scared of thunder that she doesn't want to even try to go out. I couldn't agree more! Weather is so unpredictable nowadays! Anyhoo, it's really fun playing in the rain.